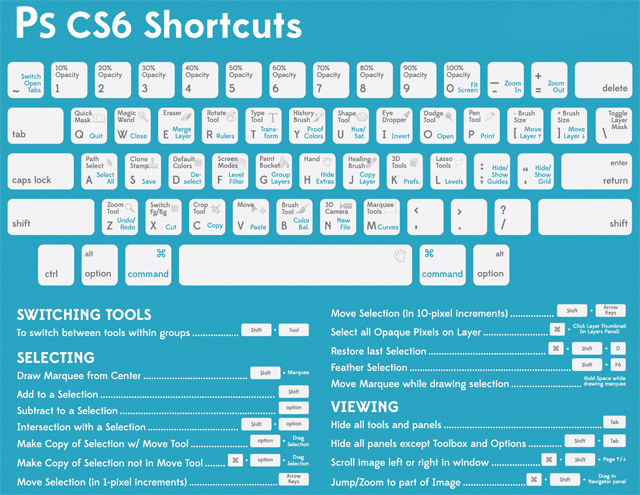 This useful cheatsheet shows the keyboard shortcuts for important Adobe Photoshop CS6 commands. Note: For Photoshop commands that are displayed in blue, such as “Quit”, “Close”, and “Merge Layer”, you must also press Ctrl on Windows or Command on Mac OS. For example, to issue the “Quit” command, press Ctrl + Q if you’re on Windows or Command + Q if you’re on Mac OS. This excellent resource is by ZeroLag. ZeroLag provided me with a special version of their existing Adobe Photoshop CS6 Shortcuts Cheatsheet. The version I posted here doesn’t display their logo.